Our book, Germanna Record 20: “Germanna Studies: Essays Honoring John V. Blankenbaker” had been sold out but we have reissued it. The design of the cover and interior pages of the print book have been updated and all photos and graphics in the book enhanced. The book is also now available on Kindle. You can read the book on any device — your smart phone, tablet, Kindle e-reader or on a browser on your computer. For more information on how to download this free Kindle Reader app to your device, click here. Or download the Kindle Reader App on iTunes or Google Play. Germanna Record 20 is a collection of essays by a range of contemporary scholars with a strong interest in Germanna. 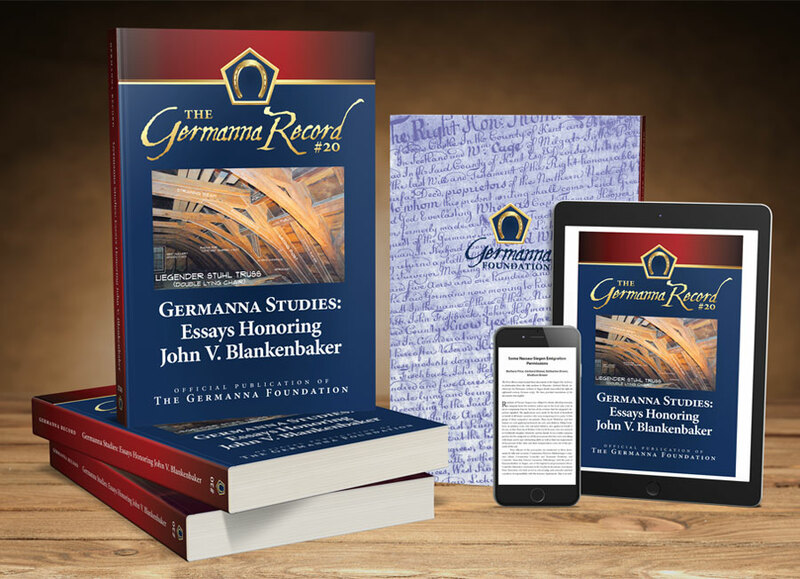 Each essay draws on the years of scholarship in Germanna-related topics on the part of each of the contributors to the volume, as their way of honoring John Blankenbaker for his many years of research, publication, and speaking on Germanna topics. Many of the essays are illustrated with documents, maps, period photographs, and contemporary photographs. All essays are carefully documented, and the 300-page volume is indexed. The editor, Katharine L. Brown, and the Germanna President, J. Marc Wheat, both provide brief introductory essays.